It was the start of a week of foggy cloudy nights in December, when my homie Vyal posted a video of what he was about to paint with 2 other artist (Leba & Daniel Lahoda). It was a massive 148 feet x 126 feet on the side of this insane building. He didn’t mention what it was for, but news broke out later that it was for a band called Foster The People. It ended taking them 11 days with 16 hours each day, which was nearly half an acre of a mural space. Those are some dedicated soldiers. So my daughter being a fan of the band found out about a secret show they were having Thursday night, Jan. 23. Even though, she had a futbol soccer game that day in Santa Monica and we happen to live in the Eastside of LA, she made it home in time. So some cool guy, well we’ll just name him “Pops” managed score to 2 free passes to the event which happen to be in downtown LA. So off we went just my daughter and I. 15 minutes later, we walk up to the mural and spot of the show 539 S. Los Angeles Street. The crowd was mellow and all these pumped up kids casually rocking out that night with the downtown view in the background of the stage and the mural to the left. It was good times indeed. 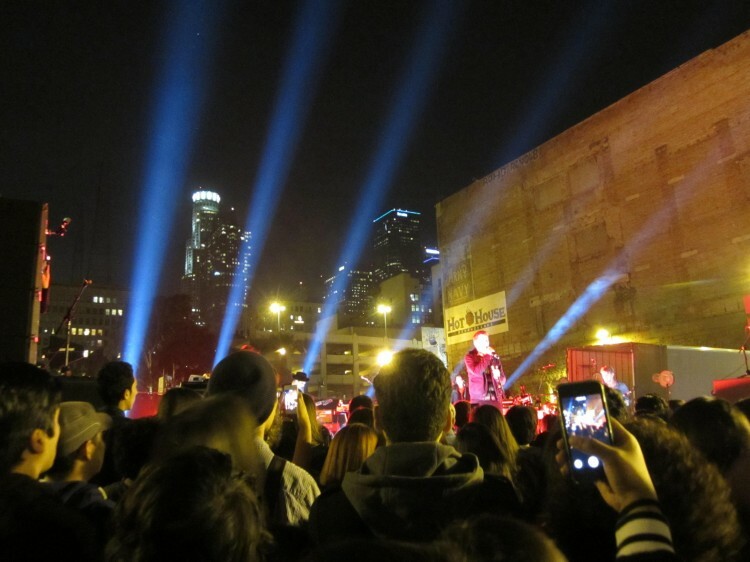 Later on that night, Mark Foster of Foster the People dedicated the massive work of art after a free concert in an adjoining parking lot. 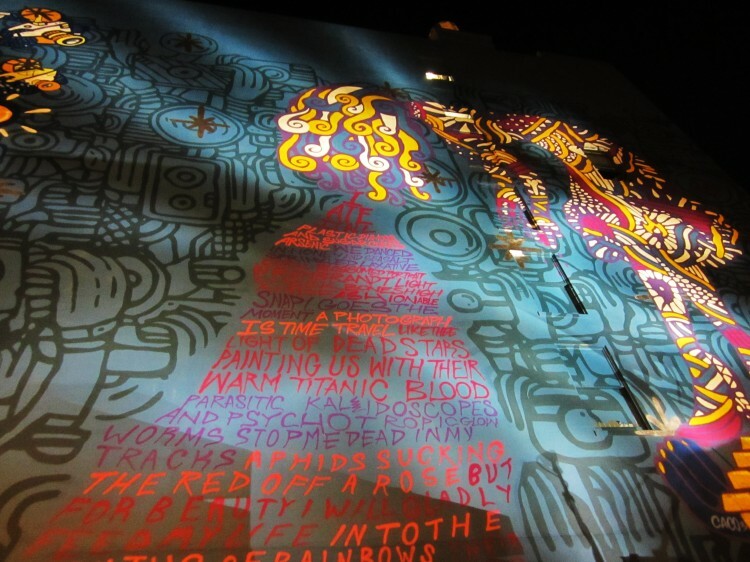 In the middle of his set, he referred to the mural as “a splash of color in the middle of Skid Row.” After the show, he gave a dedication speech, in which he highlighted his band’s motivations for creating the mural. 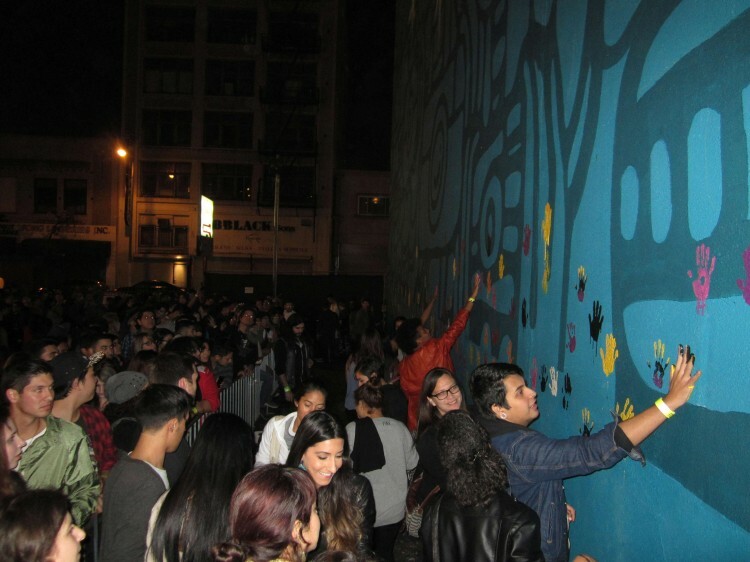 After the concert Mark Foster had some words and even got a little emotional as he wanted to have everyone who was there be part of the mural who was there for the event that night as well. So he asked everyone to hand stamp the mural with paint. It was a good show, my daughter was happy and we walked back to the car down skid row with paint on our hands and memories which I hope she never forgets. And, if she does, I can send her this link of what went down that night. Ha! I Shot the Sheriff feat. Karen O.
Albert Hofmann LSD Trip – A Bicycle Trip – Basel 1943 from Anonymous Online Marketplaces on Vimeo. Bigups to the homie Vyal. 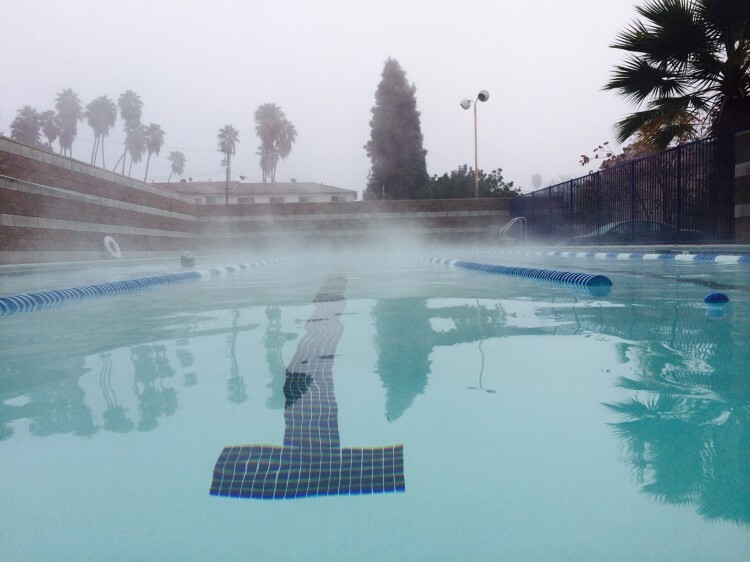 Woke up to a foggy, misty morning and headed to the pool.